April 06, 2016 / Holly R.
Our Clearance Furniture Warehouse features amazing pieces and excellent deals! You’ll find an exciting variety within the Clearance Center including one of a kind finds, discounted furniture, and pieces ready to come home with you now. 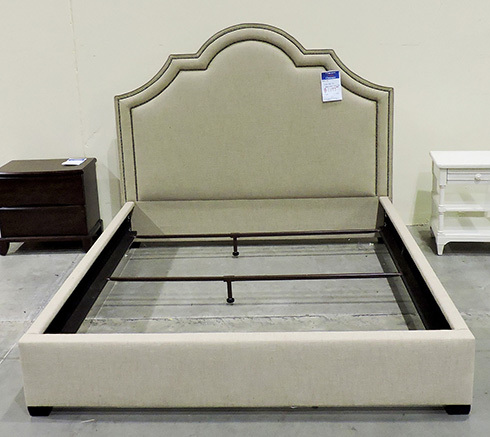 For this week’s Warehouse Wednesday we have a Madison Crown King upholstered bed by Bernhardt Furniture! Fall in love with this beautifully soft and sleek upholstered bed, perfect for the eclectic lover. This bed features a beautiful cream color fabric with contrasting nailhead trim along the headboard. The nailhead trim helps enhance the unique charming shape of the headboard. The best part of the Madison Crown bed is the neutral tones that could easily compliment any other tones in your bedroom. Pair this bed with different pieces of bedroom furniture and accessories in different colors and finishes to create a one of a kind look that fits your style. Our Clearance Furniture Warehouse features amazing pieces and excellent deals, like the Madison Crown King Bed each and every day! You’ll find an exciting variety within the Clearance Center including one of a kind finds and discounted furniture but they won’t last long and selection changes daily so be sure to visit often.